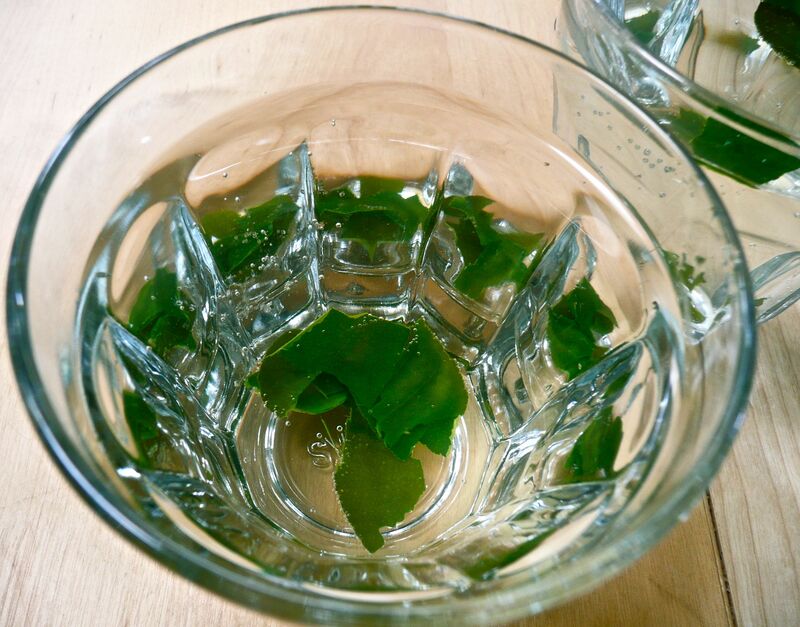 Soda-Free Sundays II: Kaffir Lime Leaf Surprises Us! My friend Sani and I tried an experiment in honor of the ongoing Soda Free Sundays campaign. We decided to choose two Thai herbs and see whether we could turn them into delicious, unsweetened soda. Contestant #1: Pandanus leaf, otherwise known as bai toey. It’s a long, thin leaf. If you’ve eaten Thai food at Pok Pok in Portland, it’s what they use to make their water taste like toasted rice. Their water is delicious. Nomination: bai toey! Sani and I were both pretty sure bai toey would work. Contestant #2: Kaffir lime leaf, otherwise known as bai makroot. It’s what you see finely chopped and tossed into panang curry or tom yam soups or things like that. It’s one of my favorite flavors, but not typically something you’d think of for a beverage. Sani and I were both skeptical, but it was my idea and she was polite enough not to tell me she was skeptical. The pandanus/bai toy was frozen, not fresh, because apparently it’s hard to find fresh here. Maybe that’s why it didn’t work. The beverage tasted like wet leaves. The kaffir lime leaf/bai makroot, on the other hand, made amazingly delicious soda! Subtle and refreshing. Would go great with Thai food or as something to bring along on a picnic. These ingredients aren’t local. But! You can actually grow your own bai makroot/kaffir lime leaf tree. I’d love to pick these fresh any time I want. However, I’m not so sure about growing pandanus. 1. Tear up the lime leaves. Throw them in a pot with the water. Boil for 5-10 minutes, or until it smells strong. 2. Cool the liquid, with the leaves still in it. You can stick it in the freezer or add ice to it or whatever works for you. 3. 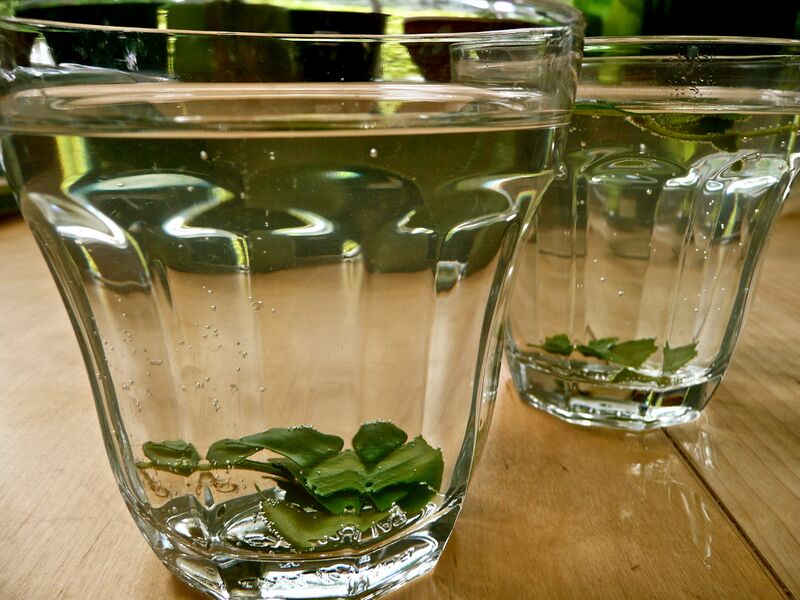 Add it to two glasses, with the seltzer, in a ratio of about two cups of the leaf water to one cup of seltzer. One strange thing we noticed: If you add the leaf water first, and then pour in the soda, you’ll see that the leaf water has a faint green color that disappears instantly when it touches soda. You can add back in a few leaf bits for color and charm. In case you haven’t heard, the Seattle City Council has ratified the Seattle Farm Bill Principles, a set of broad priority recommendations for the 2012 U.S. Farm Bill as a means of reforming the food system. I just added my name as a supporter and hope you will too (link to do so is here). Why does it matter what one city thinks of the Farm Bill? Federal food policy affects us locally, of course. It affects the cost of food, which foods are subsidized, how much money goes to those in need of assistance with food costs. It affects our health, how our city and state function, our agricultural system, all aspects of our food system. But the cool thing about Seattle stepping up and putting the Farm Bill Principles document out there is that it can inspire other cities, states, and communities–urban, rural or suburban–to get on board and voice their support too. It has to start somewhere, and it started here. Frankly, Seattle has a bit of a reputation for not putting its neck out and doing something risky and potentially-confrontational. That reputation makes me extra proud that Seattle has the guts to take leadership on this. It has a lot to do with our thriving food movement, and with leaders who walk their talk, like long-time food-movement supporter City Councilmember Richard Conlin. We have nice coalitions in Seattle of farmers, food justice activists, cooks, chefs, farmers market coordinators, health advocates, and so forth. I like the principles overall. They’re a bit vague, which makes sense in that they focus on the goals and outcomes changes to the Farm Bill would produce, although I would really love specific language about things like trading in some of the subsidies for corn, and instead subsidizing or supporting healthy meat, eggs, dairy and vegetables from sustainable farms. The detrimental effects of corn on this country’s health can’t be stated strongly enough. It’s true that it’s the basis of livelihood for many large-scale farmers in the U.S., but tobacco is also an important source of income for some farmers, and we’ve learned not to shy away from talking about its detrimental effects. Corn costs us money down the line in health care and environmental consequences. Anyway, who knows? Perhaps this year we’ll see a countrywide coalition of communities throwing their support behind the farm bill principles, or building on these principles and adding additional goals. The driving principle of the Farm Bill must be the relationship of food and ecologically sound agriculture to public health. Food that promotes health includes fruits, vegetables, whole grains, nuts, seeds, legumes, dairy, and lean protein. Improving the health of the nation’s residents must be a priority in developing policies, programs, and funding. Promote farming systems and agricultural techniques that prioritize the protection of the environment so that the soil, air, and water will be able to continue producing food long into the future. Integral to both domestic and global agricultural policies should be agricultural techniques and farming practices that enhance environmental quality, build soil and soil fertility, protect natural resources and ecosystem diversity, improve food safety, and increase the quality of life of communities, farmers and farm workers. Enhance food security by strengthening the viability of small and mid-scale farms, and increasing appropriately scaled processing facilities, distribution networks, and direct marketing. Develop strategies that foster resiliency, local innovation, interdependence, and community development in both rural and urban economies. Opportunities that create fair wage jobs are key to a strong economy. 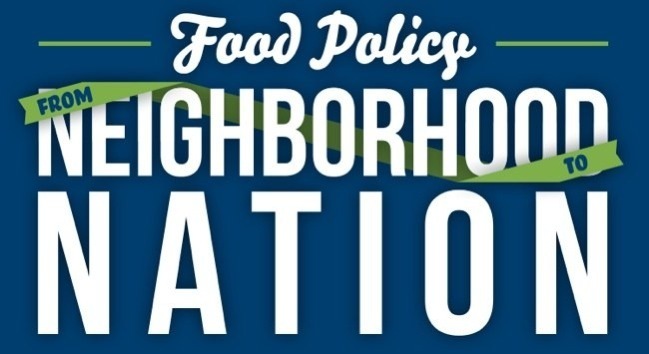 Identify opportunities and reduce barriers by developing policies and programs that increase the availability of and improve the proximity of healthy, affordable, and culturally-relevant food to urban, suburban, and rural populations. Protect the nation’s core programs that fight food insecurity and hunger while promoting vibrant, sustainable agriculture. The policies reflected in the Farm Bill impact the lives and livelihoods of many people, both in the U.S. as well as abroad. Develop policies, programs, and strategies that support social justice, worker’s rights, equal opportunity, and promote community self-reliance. It is essential to reduce compartmentalization of policies and programs, and to approach policy decisions by assessing their impact on all aspects of the food system including production, processing, distribution, marketing, consumption, and waste management. Consider the interrelated effects of policies and align expected outcomes to meet the goal of a comprehensive health-focused food system. Kosher Sustainable Meat on the West Coast? When planning for a recent Jewish community bonfire and barbecue, the organizers had a dilemma: We wanted to serve meat at the barbecue, and wanted it to be kosher so it was accessible to members of our community who keep kosher. But we also wanted it to be sustainable meat: local, pasture-raised, small-farm-sourced, never sent to a (grain-intensive) feedlot. While I’m not religious, I see a lot of value in making sure sustainability is accessible—culturally, financially, etc. This isn’t always easy. But how hard could it be to find kosher, sustainable meat from Washington, or at least from the West Coast? It turns out it’s impossible. For now, at least. 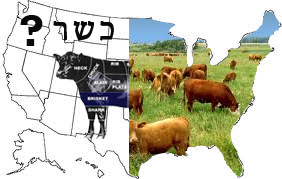 There are four sources of small-farm, pasture-raised kosher meat in the U.S. and they’re all on the East Coast. Producing kosher meat is difficult, involving, among other things, employing a shochet, a religious slaughterer who has gone through extensive training and is a devout Jew. There is also more demand for kosher food on the East Coast. Due to low availability of kosher products, on the West Coast we’re a little more used to settling for what kosher products we can get. Why grass-fed/pasture-raised meat? 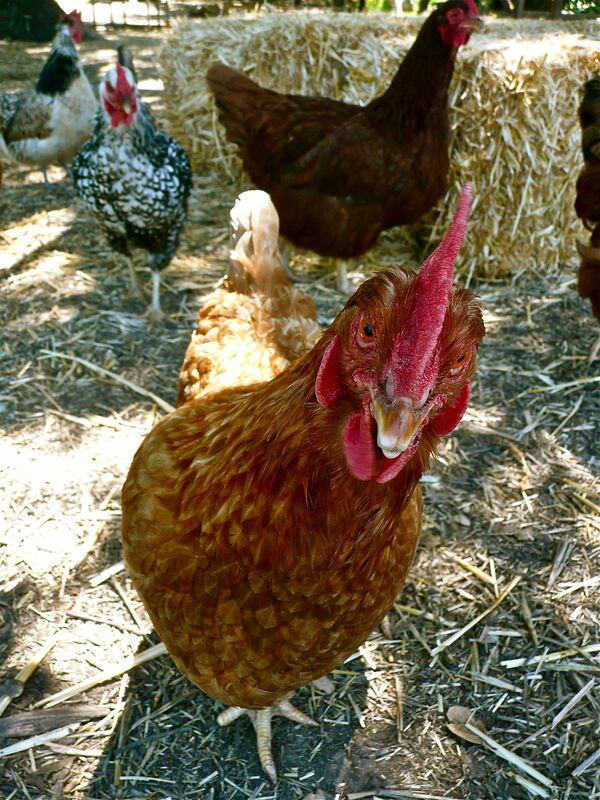 Cows and chickens raised on pasture and not sent to a feedlot are just more environmentally-friendly, but also yield delicious meat higher in good-quality fats and important fat-soluble vitamins it’s hard to get elsewhere. It’s also a great way to support small farmers, and not just large producers. We used some meat from one of the East Coast sources for the event so people could taste it, but obviously it’s not sustainable to fly meat in from the East Coast every time we want it, or even more than once or twice. Other options abound for Jews who keep kosher, of course. Some people follow vegetarian diets and eat plenty of eggs and milk from local farm animals raised on pasture. Scaly fish is kosher and we live in a great region for fish. We’re also lucky to live in an area where a wide range of vegetables and fruit can be grown. But people choose to eat meat for many reasons, and there’s no reason people should have to choose between keeping kosher, eating sustainably, and eating meat. Some people and organizations, like the UW’s Hillel/JConnect program are trying to make kosher sustainable meat happen in the Northwest, or to connect with others trying to make this happen. They may even bring a shechter in to produce and freeze a supply of kosher sustainable meat, working with local, small farms which raise animals on pasture. But they need support and help to make this happen. This means other people and organizations to figure out how to do this, what the logistics will be, and how to make it happen. They also need to know that there’s interest. GRASP: My foray into filmmaking and neuroscience. Here’s a neuroscience film I made, for fun and for a science communications class. I used footage from the San Francisco Ferry Building farmers market, since I was meeting up with my parents there. Since farmers market produce features heavily, I’m calling it an excuse to post the film here. I’m going for, uh, charmingly amateur. Enjoy! Food Justice: A Social Movement Takes Root. Lecture tonight (Mon) at UW. 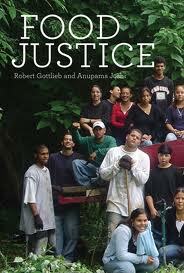 If you’re near the UW campus in Seattle, don’t miss Robert Gottlieb’s talk tonight. He’s one of two authors of Food Justice. CAGJ (Community Alliance for Global Justice) is organizing the event. The event is from 7-8:30 at UW Architecture Hall 147, Grant Lane and Stevens Way, Seattle, WA. I haven’t read the book yet. I’m drawn to it, though, because it highlights the justice and access parts of the food movement, looking at the food movement though a lens of social justice. He talks about global, systemic problems like obesity, and seems like he’s not afraid to hold fast food chains and beverage companies accountable. Check it out tonight if you’re around! I’m at this marvelous conference for the next few days, discussing food policy issues, both local and national. This includes topics like farm-to-cafeteria work, food access and hunger issues, and even local and national visions from the food movement about changing the Farm Bill. Seattle is a bit of a leader on this topic; check out the Seattle Farm Bill Principles here. Other cities are considering supporting these principles or developing similar ones. If you have particular food policy questions, local or national, of interest you’d like me to bring up or find out about here, send me a message. If you’re here too, drop a note and say hi. I’m all for making things from scratch, and I think it would be fun someday to make my own Thai curry pastes. But I have to say, there’s something wonderful about having pre-made curry paste on hand. Curry paste + coconut milk + seasonal vegetables + meat = one of my favorite formulas for a fast and flavorful meal. Last week, I found myself with panang curry paste on hand, some fresh asparagus, spring carrots, and shiitakes from the farmers market, and a lamb shoulder chop. Less than fifteen minutes later, I had dinner. 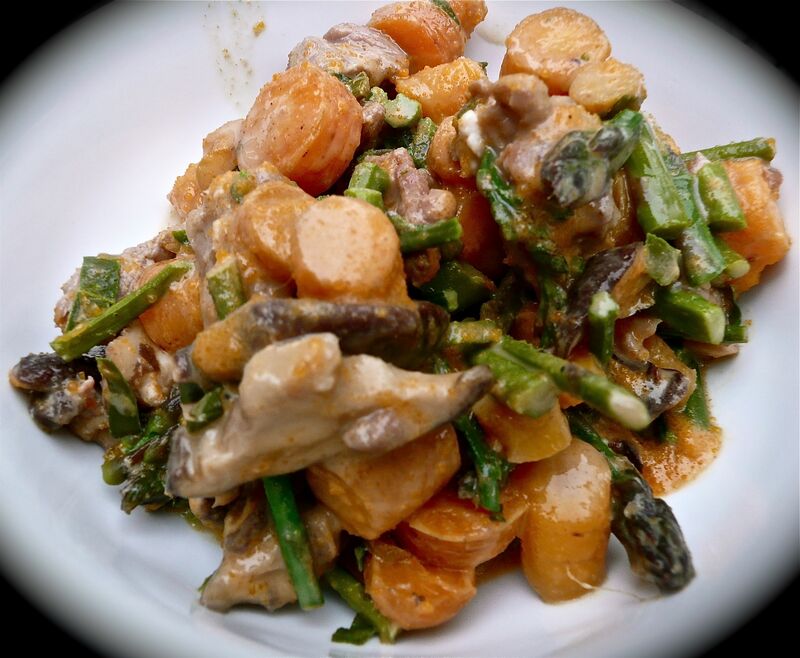 If you’re short on time, and heavy on asparagus, try this recipe out. You can substitute in other vegetables, of course. This can be served over rice or just eaten with a spoon. I did the latter. 1. Prepare vegetables: Remove hard parts from asparagus and cut into bite-sized pieces. Slice mushrooms, discarding harder parts of stems. Cut carrots into small pieces. Cut lime leaves into thin strips with a sharp knife or scissors. 2. Prepare meat: Cut lamb shoulder meat off the bone, salvaging as much meat as possible. You can save the bone in the freezer for stock. Keep fat on the meat except the very outer-most layer of the outer fat, which is a bit too tough to chew. 3. Heat oil. Add carrots to pan and stir a few minutes, letting the edges brown slightly. Add mushrooms, a bit more coconut oil, and a dash of fish sauce. Cook until mushrooms brown and release out some of their oil. 4. Add curry paste to the oil. Let it bubble and cook. Stir it gently to spread it out. 5. Add meat and lime leaves to the oil/curry mixture. Let meat brown on all sides. Add the asparagus shortly after. 6. Add the coconut milk and stir to combine. Let the curry simmer for just a few minutes; you don’t want to overcook the lamb. While it’s simmering, taste it for saltiness and adjust fish sauce as desired. 7. Serve immediately, as-is or over rice.